Joseph Kerwin, M.D. (born February 19, 1932) is an American physician and former NASA astronaut. Kerwin was the first physician to be selected for astronaut training, and served as science-pilot for the Skylab 2 mission in 1973. Born in Oak Park, he graduated from Fenwick High School in 1949. He received a bachelor of arts degree in philosophy from College of the Holy Cross, Worcester, Massachusetts, in 1953, and a Doctor of Medicine degree from Northwestern University Medical School in Chicago in 1957. Kerwin went on to complete an internship at the District of Columbia General Hospital in Washington, D.C.; and attended the United States Navy School of Aviation Medicine at Pensacola, Florida. He was designated a naval flight surgeon in December 1958. Kerwin was a captain (now retired) in the Navy Medical Corps, joining in July 1958. He earned his wings at Beeville, Texas in 1962, and logged 4,500 hours flying time. 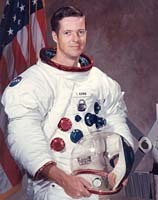 Kerwin was selected as a scientist-astronaut by NASA in June 1965. He was one of the capsule communicators (CAPCOMs) on Apollo 13 (in 1970). Kerwin served as science-pilot for the Skylab 2 (SL-2) mission which launched on May 25 and terminated on June 22, 1973. Kerwin retired from the Navy, left NASA, and joined Lockheed in 1987. In 1994–95 he led the Houston liaison group for Lockheed Martin's FGB contract, the procurement of the Russian "space tug" that has become the first element of the International Space Station.